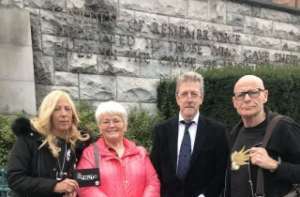 (Left to right) Antoinette Keegan, Kate Nash, Stephen Travers and Eamonn McCann at the Garden of Remembrance before the public event. (Photo: Cate McCurry/PA Wire). Speakers from the massacres at Ballymurphy, Derry, of the Miami Showband and the victims of the Stardust Fire addressed a Dublin Audience on Wednesday evening last (19th September) in the hall of Club na Múinteoiri.